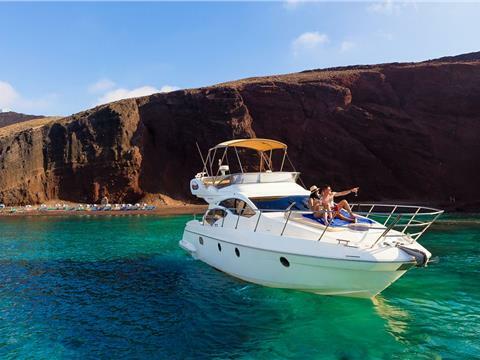 Set sail from the southern port of Vlyhada early in the morning and follow the coastline until you reach the Red Beach in Akrotiri, one of the most beautiful beaches of the island with a distinct red color caused by the mineral rich and iron soil. Then, head to the White Rocky Beach, which you can only access by boat. A stop for swimming and snorkeling is highly recommended since it is difficult to resist the crystal clear blue waters with the rich underwater environment and reefs. Leaving the White Beach and heading to the Venetian lighthouse, sail below the Indian rocks through caves and rock formations, characteristic of the Aegean landscape. After sailing below the lighthouse, the yacht will turn and enter the caldera of Santorini. There, you will see everything opening in front of your eyes. The picturesque white houses hang from the cliffs like grapes off the cliff formations and the volcanic islands of Palea and Nea Kammeni. There, you will have the chance to sail below the traditional villages of Fira, Firostefani, Imerovigli and the overwhelming rock formations consisting of basalt and pumice. From there, head to the crater of the volcano and sail around it to have a full view of it and stop at the thermal springs for swimming at the sulfurous waters, that offer a natural spa. Palia Kammeni, an inhabitant volcanic island next to the volcano, offers unique private bays and beaches, ideal for swimming and snorkeling, and perfect to enjoy your own privacy away from crowded locations. As you enjoy yourself, the attentive crew will prepare on-board a delicious fresh meal (lunch or dinner) consisting of a full menu with BBQ chicken fillets, fish fillets, shrimps, Greek salads, tzatziki dips and appetizers all accompanied with local wine, beers and cooling beverages. Amazing journey around the island. Perfect day overall! Amazing experience definitely worth the money! If you're even slightly considering doing this activity you should definitely do it! Spiridakos had such friendly staff during the whole experience. They pick you up right at your door no matter which city you're staying in. The 5 hours on the boat is an excellent amount of time. You see great views of the island. We stopped for swimming once at the warm waters near the volcano, then we snorkeled at another beach for a nice amount of time. Not much in the water but it's still nice to have a swim. We had a really good lunch prepared by the crew, then stopped another time for snorkeling. There was plenty of time for relaxing on the boat and in the water, really fun experience! Thank you for your kind words! We are so delighted that you enjoyed your Cruise on board Also, thank you about your booking feedback! We hope to see you again on board for more unforgettable sailing moments! If you cancel at least 10 day(s) in advance of the scheduled date, there is no cancellation fee. If you cancel within 10 day(s) of the scheduled date, there is a 100 percent cancellation fee.